looking skin. Contrary to popular belief, creams and lotions can’t penetrate the skin’s surface. This means they can’t reach the deeper layers of skin where much of the aging process happens. Tell me about your skin. Reduce or remove freckles, liver and brown age spots (lentigines) sun damage and wrinkled skin, permanent reduction of unwanted hair, stimulatiion of new collagen synthesis to improve skin tone. 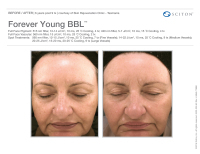 A recent study shows that patients can keep their skin young looking, 10-12 years younger. ​​IPL Photo Facial Rejuvenation is designed to combat the effects of aging and damaged skin in a softer, gentler way. Redness and flushing of rosacea can be reduced 80 to 90 percent and can be used to treat the full face, chest, neck and even the hands. This treatment works best in people with fair to medium skin color. The color of darker skin absorbs some of the energy of the treatment rather than all of the energy being directed at the pigmented or vascular lesions. 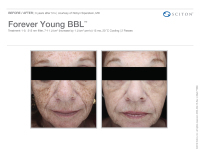 Because the effectiveness of the treatment is enhanced by the difference between the color of the pigmented lesions or vessels and the surrounding skin, one should limit sun exposure for 4-6 weeks prior to treatment. If the skin is tan, it should be allowed to fade prior to treatment. Discontinue use of tanning beds or self tanning creams as well. After the initial preparation, the laser technician will move a handpiece over the skin which delivers laser light. 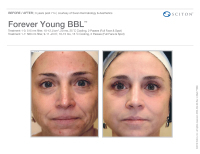 This laser treatment breaks up pigment in the brown spots and closes off small vessels. Most people perceive the light-pulses as a gentle "snappy" sensation, which causes little or no discomfort. The laser technician may pre-treat the area with a topical anesthetic if needed. Pigmented lesions will slough off after one treatment usually within 72 hours. The vessels will then fade during the procedure and will clear after about 10-14 days. Most people experience some mild, temporary redness and puffy (similar to a sunburn) in the treated area for a short period of time. This does not interfere with normal activities and usually subsides after a day. How many treatment sessions are needed for optimal results? Although one may see excellent results after just one treatment, it may take two or four treatments for optimal results. Schedule a FREE consultation to determine the treatment that is right for you.